Welcome to NIA Technologies, Inc.
We use a secure screen sharing utility call CrossLoop. It enables us to connect to your PC from anywhere on the Internet in seconds without changing any of your firewall or router settings. It only takes a few minutes to setup and no signup is required. Please be assured that we can only access your PC with CrossLoop with your permission. Once you cancel out of CrossLoop we will no longer be able to access your PC. You can get up and running with CrossLoop in under 2 minutes. Simply download and install the application and it will automatically configure itself to your network environment. 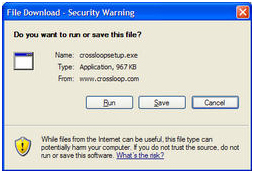 Click Free Download to start downloading and installing CrossLoop. When the CrossLoop installation begins, click “Run” in each window that appears. Follow the simple instructions to install CrossLoop on your computer. As part of these instructions, you will be asked to accept the CrossLoop Terms of Service. In some cases, the downloaded text of these Terms of Service shows an earlier Version than the definitive version which is currently Version 1.3, last revised 1/11/07 and found here. The Terms of Service includes two separate licenses. The first license is for the proprietary CrossLoop shell program and the second license is a GPL for the TightVNC program. If you have any questions about your rights to the software of these two programs, please see our detailed description of how we use VNC. It will ask you to create a free CrossLoop account. You do not need a CrossLoop account to use the application. However, if you frequently need help on your computer, an account will help you keep a history of all the work done on your computer, which will be beneficial to anyone helping you in the future. Think of this as your computer’s medical history. To bypass this option just cancel out of the rest of the setup and it will automatically start the CrossLoop program. If we are not already on the phone, please call me at (954) 255-2003 so we can get started. The following is what I will ask you to do in order to access your PC. Launch the software by clicking on the CrossLoop icon on your desktop. Click on the “Share” tab. Tell us what your Access Code is from the “Share” tab. You will be asked a final time for permission to allow or deny us to access your PC. Please click on the ‘Allow’ button. Spybot - Search & Destroy can detect and remove a multitude of adware files and modules from your computer. Spybot also can clean program and Web-usage tracks from your system, which is especially useful if you share your computer with other users. Modules chosen for removal can be sent directly to the included file shredder, ensuring complete elimination from your system. For advanced users, it allows you to fix registry inconsistencies related to adware and to malicious program installations. The handy online-update feature ensures that Spybot always has the most current and complete listings of adware, dialers, and other uninvited system residents. Copyright © 2008 NIA Technologies, Inc.